Egyptian Delegation @ the Temple of Apollo @ Corinth, 2014. 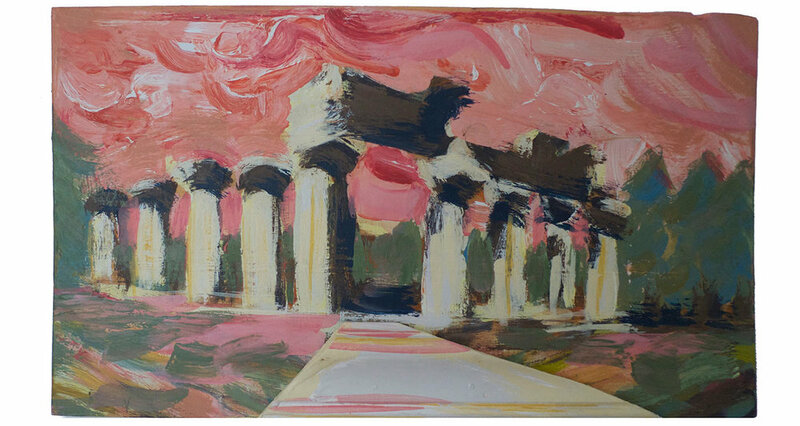 Pittsburgh Paint on Wood, 10" x 16"
Kansas Farm Mission @ the Temple of Poseidon in Hera, 2014. Pittsburgh Paint on wood, 21 inches x 18"
Pittsburgh Paint, fabric on wood, 17 inches x 17"
Another Oracle @ Delphi, 2014. Pittsburgh Paint, fabric on wood, 15" x 18"
Chick-a-dees @ the Temple of Apollo, 2015. Pittsburgh Paint, fabric on wood, 22" x 13"
Hoe-down @ the Temple of Zeus, 2014. Pittsburgh Paint, fabric on wood, 22" x 18"
Swallows @ the Temple in Sicily, 2015. Pittsburgh Paint on Cabinet, Molding and Fabric, 24" x 16"
“…enjoying our travels to Asia Minor, be home soon…”, 2014. Pittsburgh Paint on Kitchen Cabinet, 21" x 17"
Sacred Pilgrimage to Athens, 2014. Pittsburgh Paint on wood, 12" x 9"
Burnt Offerings @ the Temple of Athena Nike, 2014. Pittsburgh Paint on wood, 20" x 19"
Pittsburgh Paint on Wood with Molding, 22" x 18"
Paisley Haboob @ Pompeii, 2014. Pittsburgh Paint and Textile on wood, 12" x 9"
Bed & Breakfast @ the Temple of Athena, 2015. Pittsburgh Paint on Wood, Molding and Fabric, 22" x 21"
Evening Visit to the Parthenon, 2015. Pittsburgh Paint on Cabinet with Molding, 18" x 15"
Temple of Apollo @ Corinth with Wren, 2015. Pittsburgh Paint on Cabinet with Molding, 24" x 16"
Paisley Sunset Over Ruins , 2015. Pittsburgh Paint on Wood with Fabric, 15" x 11"